With Noko's Mobile Web App you can log time and use your timers from the web browser on your phone. If you're on iPhone, you might want to install the Noko app from the App Store. The quickest way to sign in is to go to nokotimetracking.com into your mobile browser's address bar. This will immediately load up the sign in screen or bump you right into your Noko account if you have Remember me activated. Noko automatically detects if you're using it from a phone and shows the mobile web version. On iPhone, if you sync your passwords via iCloud, you can tap on AutoFill Password to have your phone fill your email and password from Safari on your Mac. Fill in your email and password, then tap Sign in to load up Noko's mobile version. After signing in, Noko will open on the mobile dashboard. This works the same as the dashboard on your desktop web browser, showing you your latest entries. To log a new entry, tap on Log Time on the top right. To open the desktop web version, contact support or sign out, tap on Settings on the top left. To switch to the mobile Timer, tap Timer in the tab bar on the bottom of the screen. On Noko mobile, the time entry form looks a bit differently from the one on the desktop, as it's optimized for touch input. To change the project (by default, Noko preselects the project you logged time for last), tap on the project name, then select the project (or no project) from the list of projects that appears. 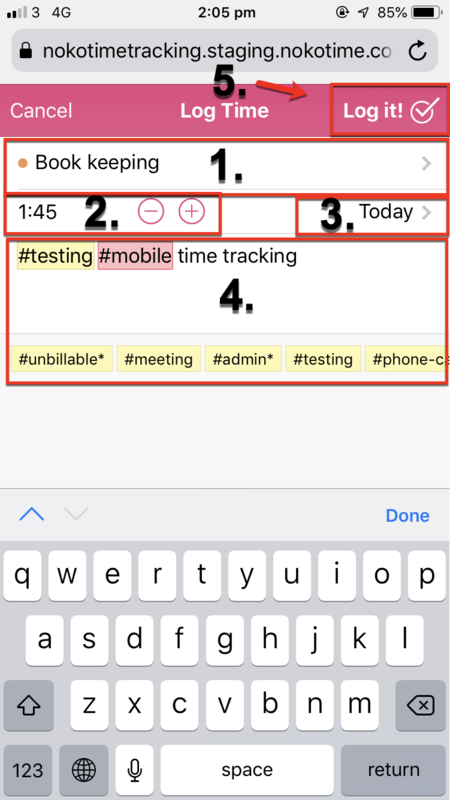 Enter time by using the - and + buttons, or by tapping directly on the time field and editing it. By default, the date logged for is today. To change it, tap on Today (or the selected date) and then choose a new date from the calendar that appears. To enter tags and a description, tap the description area just underneath the other fields. While you type, the tag completer will suggest tags. Tap a tag to add it. Like on the desktop, tags that are already in Noko are highlighted in yellow, and new tags are highlighted red. Once you're done entering your time, tags and description, tap on Log it! to log your time entry. You'll go right back to your dashboard and will see the new entry. You can also edit and delete entries, as long as they're not locked (entries are locked when they're invoiced, approved or in an archived project). To edit an entry, just tap it. To delete an entry, swipe left on the entry. Then tap the red Delete button that appears. The mobile Timer is a simplified version of Noko's timer on the desktop. You'll see the exact same timers as on the desktop, which means you can start or Timer on your laptop and then later log it from your phone (or vice versa)! To start a timer for a project, tap the project name. 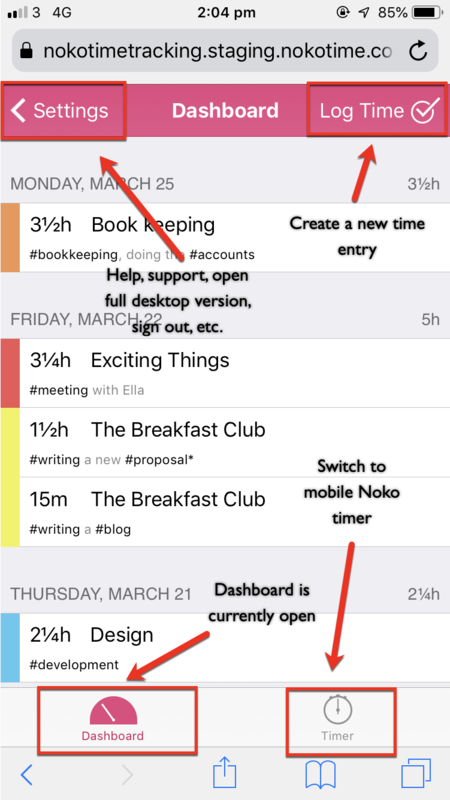 If a timer is already running, Noko will pause the previous timer and start the one for the project you've tapped. If a project already has a paused timer, you'll see the time that has so far elapsed shown in the project list. If there's an active timer running, it will be shown large upfront and center. Tap it to pause and restart. To log your timer, tap Log Timer on the top right. 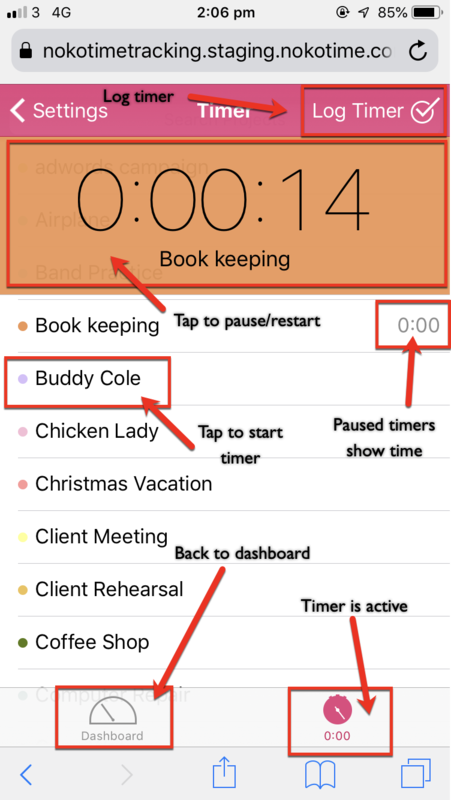 To delete a timer without logging it, swipe left in the list of projects and then tap the red Delete button. If you need to run reports, create an invoice or use other features of Noko while on the go, you can switch to the full desktop web app. On the mobile Dashboard or Timer screens tap < Settings. Tap on Full Desktop Version. Noko will now in the version you know from your desktop web browser. To switch back to the mobile version, tap the large Switch to mobile version banner that is shown on the top of any page in Noko. The desktop web app is not optimized for the size of phone screens or for touch input, and some isolated features like copy to clipboard for sharing invoices or reports are not available.